Savant contacted 15 doctors in 7 countries after multiple previous spine surgeries didn’t help him. See why he chose Spine Connection and ONZ Germany. On the first day we met he arrived with a walking cane, and we assisted him every step of the way. He first contacted us in early March 2018. He had lower back pain with intermittent episodes of severe pain and referred nerve pain with loss of sensation in both legs. He also had neck pain, headaches, and referred pain in his right arm. In Late 2016, Savant underwent L3/4 and L4/5 decompression surgeries, to open up nerve pathways. He had an L3/4 bilateral discectomy and rhizolysis. His symptoms would increase and return within 2 years, and further surgery was indicated. He also had a previous spine surgery in Korea in 2013. Neck: Total Discectomy by Anterior Surgical Approach and Disc Replacement at C5/6 and C6/7. Lower Back: Total Discectomy by Anterior Surgical Approach and Disc Replacement at L3/4 and L4/5. Savant met with Jake Lemon (Director of Patient Services) in person and discussed his planned surgery in Germany. Savant travelled to Germany for his 4-level disc replacement surgery in Mid-June, 2018. According to Dr. Bierstedt’s experience, both his neck and lower back surgeries were performed together under 1x anaesthetic. The surgery took 4 hours. 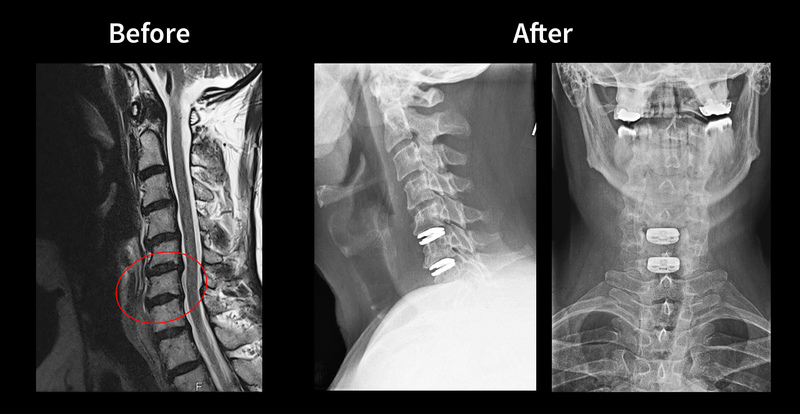 Neck X-Rays show accurate placement and function of the disc implants after surgery. 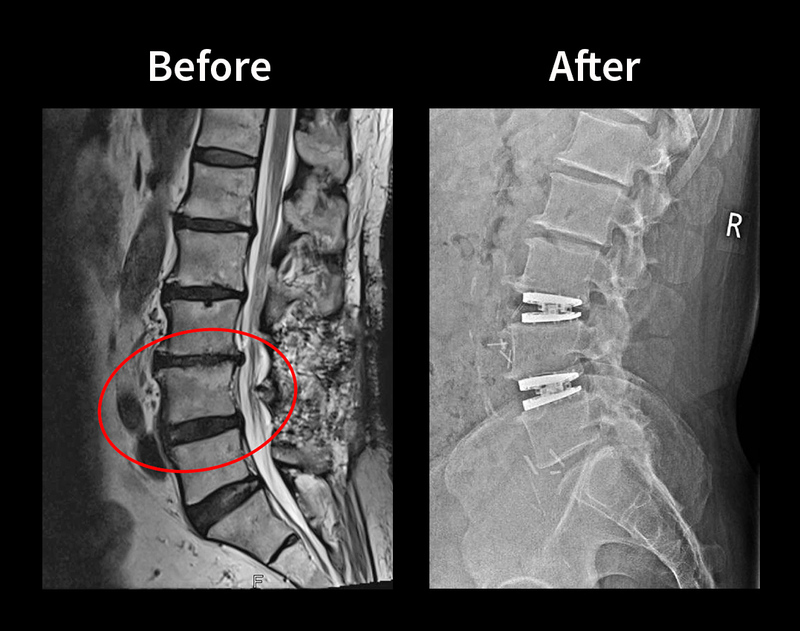 Lower Back X-Rays show accurate placement and function of the disc implants after surgery. Please feel free to add this to your website as maybe you were not aware… I had one complication at my L3 /L4 level leading up to surgery. When I spoke with Dr. Thomas Bierstedt the day before the surgery, he said at my L3/ L4 area there was extra bone growth, some scarring and adhesions, possibly due to my previous discectomy surgery. He indicated this could be an issue and a challenge and he may have to put a cage rather than the New-Generation Artificial Disc implant. But he did say he will look and try to work it out when he has me opened. At that time Thomas was still concerned over this area. After the operation the hospital rehab doctors told me that Dr. Thomas Bierstedt went out of his way to get the ADR implant into me. They said he spent close to an hour to clean and separate the blood vessel, bone and nerve that were caught in the bone growth and with the degeneration that was set at the L3/L4. I was told on the first day that my operation would be 2 hours but it went to 4 hours with this one complication at L3/L4. I would like to advise people who want to fix their backs, don’t wait. Open your eyes see the issues and ignore the surgeon who say wait for a while or fusion is the only option etc. Find a second opinion or more. In my case I knew what I had and what I was hearing from the surgeons. There were conflicts. If you have a stone in your shoe, don’t work around it or patch it up. Address it directly and find other alternatives (even outside Australia) to seek advice. Remember you are the person who will finally make the right decision or a bad one. I have lots of GP friends. They mention many spine patients in Australia seldom recover from their pains and in fact some are worst after surgeries. Why? Because they leave it too long to be dealt with. If they are scared they wait thinking it will get better but in fact the opposite is the truth. My complication at L3/L4 is highly due to the advice the Spine doctors proposed in Australia that I should try this or that and do this or that and wait. Remember once your Nociceptors (pain nerve endings) have been found in scar tissue, it can be painful. … Nerves are supposed to slide through and around muscles, not stick to them. If a nerve happens to lie next to scar tissue, it can become entrapped. The scar tissue “glues” the nerve to the muscle. In my case it was glued and wrapped to the scarring. It’s going to take a very long to undo it – if at all possible. So once again understand, please seek help from multiple specialists, even overseas, to get the right answers. I want to mention in the web site that when I spoke to Jake Lemon at Spine Connection, he told me a few times over the phone that I was in great hands as far as he knew. He was calm and confident from his tone and I believe he was speaking it from experience. From his experience he mentioned that the Germans are meticulous and precise and the doctors would look after me and they love a challenge when presented. Well in my case there was one. Great thank you to MD Thomas Bierstedt in getting my spine right. Another big thank you to Jake Lemon who helps the patients get organised, and was there for me at every step till I reached Germany for my operations. Jake always had answers to my questions (remember I had three previous major spine operations and my question were super hard ones lol). When he did not have answers to my questions he would always refer back to Germany and get me the right answers. Jakes experience is very high and he knows things inside out and is of great help compared to others I have spoken and dealt with around the world in the past. Myself after the medicos visiting places in Dusseldorf after my operation. Showing no walking stick, no bending when walking and a with a straight back. Three charts pictures labelled for you to show or use on the web site if need due to my complication. Savant has given us permission to share his story and spine imaging and will keep us up to date with his ongoing recovery. Please check back to this page for future updates.